Well, mfogle, Teferi, Temporal Archmage is a tier 1 cEDH deck, and some argue to be the best, or tied for best deck in the format, next to tempo lists like Najeela, the Blade-Blossom combo, Captain Sisay stax-combo, and Kess, Dissident Mage consultation lists, to name a few. It does this because it combos with The Chain Veil , a card that goes infinite with it, as well as the commander's synergy with Stasis / Static Orb / Winter Orb in a stax prison deck with combo plan-b. 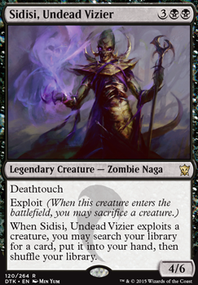 Just taking that approach, Saheeli Rai combos with multiple cards, such as Liquimetal Coating + Altar of the Brood , is in great colors for an artifact list, and helps in getting to the combo, with scry (not much, but not little), while being incredibly cheap to cast. Then there is Tezzeret the Seeker , which both fetches The Chain Veil , and having combos with it. It also has a combo with a Rings of Brighthearth , Goblin Cannon , and Basalt Monolith setup if you need me to explain that one. Outside of that, Teferi, Hero of Dominaria makes an incredible stax-control build abusing the untap effect with Stasis , Winter Orb , and Static Orb , while drawing you extra cards, mostly removal and countermagic to protect it after it hits. Untapping two blue sources holding up a Counterspell would be incredible alone, but with the stax synergy and card draw it just makes it really easy to break. For pure value commanders that would pub-stomp LGS's if a player just wants to spend the money, there would then be Jace, the Mindsculptor. That sounds fun, doesn't it! Mono-blue control always is the pinnacle of EDH fun. Think that's it? 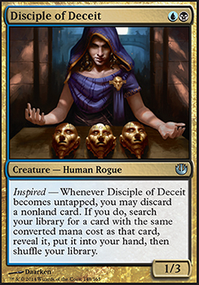 Dack Fayden , vintage allstar, cEDH allstar, greatest thief in the mutliverse, and incredible Careful Study / Faithless Looting every turn or a Steal Artifact once in a while. On R/U walkers, Ral Zarek . The legacy Stasis walker. Now in EDH, where Stasis is legal. Seems nice. Harmless. Even from the new set, there are incredible busted walkers. Ashiok, Dream Render allows you to shut off tutors and graveyards with relative ease. It is so good at stopping combo decks, and yet because it doesn't affect the user, it will just be run in a combo deck, blue/black has a plethora. Honestly if this was legal in cEDH, I'd imagine it tier 1.5. Ral, Storm Conduit makes a great storm EDH commander, possibly better than some alternatives. Cards like Doublecast , Fork , Twincast , etc. all can be copied infinitely targetting each other, which allows Ral to go infinite damage. It is a sweet combo deck, another very competitive walker. Teferi, Time Raveler could actually see very competitive play, like the original Teferi, Mage of Zhalfir was occasionally thought to with Knowledge Pool , really with the addition of minor removal/draw, some worse flash enabling IMO, and white added into the color identity, and a cheaper cost. 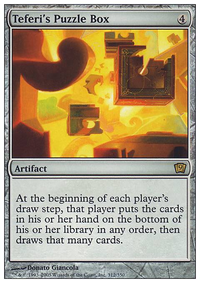 This means Enlightened Tutor , cards like Rule of Law or other stax, etc. can combo. So mfogle, do you really think a tier 2 deck like Prossh, Skyraider of Kher , some tier 4 deck like Edgar Markov , tier 3 Muldrotha, the Gravetide , or tier 2.5 Niv-Mizzet, Parun or Narset, Enlightened Master are so much better than any walker throughout Magic History? I haven't been playing with or against this commnader yet. But it's one that floats on my list too. Circular Logic : Awsome, this makes you so much more dangerous to play against. As for Barren Moor and Lonely Sandbar I think you have the ratios right on the money for you mana base. I agree with you entirely on your engine choices; since they are so vulnerable perhaps a couple of Dive Down s might be used main or side board if you think your not able to keep your engines alive long enough. I really like the survivor duo btw the more I look at them. Drop an edict and a duress perhaps. That way you keep your disruption and removal fairly at the same level. 4 Brain Gorgers the second and third game can do terrible things. Because at worst its a no flashback edict. Best its a 4/2 for 2 slamming your opponents face. YOu want to be aggressive with this deck and this card is aggressive. Ehhhhhh Careful Study is a poor mans Faithless Looting . Still it is a one drop discard 2 outlet. so perhaps a 2 of or one of main board? You could drop a Sign in Blood but I'm not really sure which is the right option. As to Looter il-Kor YES. A one or two of that can really help you loot through your deck. No clue what you would drop help. Perhaps one of each survivor? Thorn of the Black Rose is an EPIC draw engine and blocker.BUT WHAT TO DROP?! Thanks for the nice words and feedback! I'm honestly not sure what's up with Circular Logic . I tried changing the printing but it still shows as an illegal card despite it definitely being pauper legal. 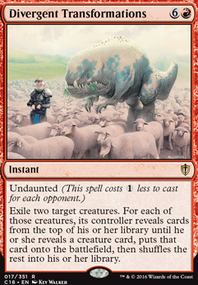 I was just talking today with some people who suggested putting in some cycle lands, I wasn't sure if it mattered whether they are Barren Moor or Lonely Sandbar . I will definitely do that though. Makes them way more valuable in late game. I had thought about Putrid Imp and Aquamoeba but both are pretty vulnerable to ping (amoeba opens up when I activate its ability) and I liked the relatively more hearty Dragoon with the evasion it gives. I settled on Oblivion Crown as the alternate/supplementary engine since it can allow Cunning Survivor and Grisly Survivor to become even more threatening while being a little more difficult to remove (at least that's my inexperienced thought). I really like the idea of Gorgers for applying pressure but I'm just not sure what to take out for them. Maybe I don't need Duress and Divest in the sideboard, so I can move some removal (of which I have a lot) and put the Gorgers in. I'm also wondering if I should have some way to draw. Something like the Careful Study I have in the maybe board. It's why I was also considering Looter il-Kor . I've also kicked around the idea of a Thorn of the Black Rose for the draw that comes with Monarch. Sorry for the lengthy reply and thanks again! This deck has been goldfishing between turn 3-6 pretty normally, but with most cEDH decks pushing those turn 3 wins, its becoming more important to hold up more interaction. I've swapped out some hard draw for more counterspells, which should help us get to our combo window as well as stop other players in a pod from snagging that vic. Blighted Bat turned out to be too niche, and there are almost always other ways of reaching a vic when the Bat is open to us, and its a complete dead draw. 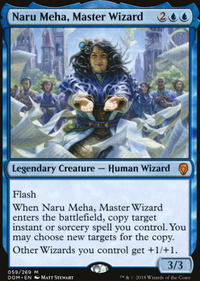 Personal Tutor was a neat way to fetch Ad Naus, but the replacement Shred Memory is better aimed towards our combo pieces, and has reactive uses against other decks as well. 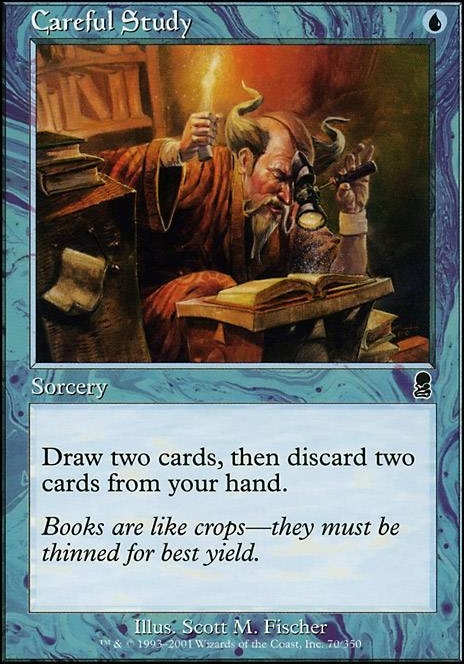 Personal tutor simply fell short when compared to Mystical Tutor , and I never want to telegraph my play by putting Ad Naus on the top deck and then passing (Myst tut avoids this by having instant speed and can also grab instants). Mistcaller is an interesting add right now, token decks aren't running rampant but you do see Kiki combos in decks such as Blood Pod, and you see Dualcaster Mage combos in mono R value sometimes ( Dualcaster Mage + Twinflame is not a lot of slots, most decks can fit it pretty ez if they want). Mistcaller s primary role is to be a sacrifice outlet for Lazav, identified during testing how painful it is to acquire infinite mana with no outlet. Narcomoeba I'm on the fence about, because it is painful to have it in hand, and with less hand discard a la Careful Study we may end up hard casting it sometimes. Only requiring 2 critters for Dread Return when we are gravey flipping is a huge boon though, and testing will reveal if it deserves its slot. Hey, saw your forum topic asking for help. Do you own the cards that are in the maybeboard? There's several there that are much better than cards in the main deck. Consider building this Dimir deck with Sultai in mind? 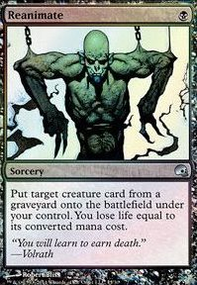 If your goal is to play Sultai with Tasigur or Muldrotha later on then my advice is get playable cards that you can use in those decks, but for the time being get blue, black and Dimir cards and play them here with budget good stuff self-mill/reanimation strategies. Good stuff being playable spells especially creatures who have good ETB (enter the battlefield) abilities. Tasigur and Muldrotha use self-mill strategies not opponent mill strategies. Tasigur and Muldrotha abilities only work with cards in your own graveyard. Self-mill is much more powerful than opponent mill in multiplayer Commander. If you like this idea then I can further help you to change this deck to make it easier to convert it into Sultai later on, but for now still being a good Dimir deck with Scarab God as Commander. Let me know your thoughts, good luck. May I suggest to you: Careful Study , Thought Scour , and Circular Logic ? If you want to work with Foil, it's a really good idea to include some Daze s and some Gush es because you're not going to want to rely on just drawing Islands. Also include Ash Barrens in your mana base once you have one. ForsakenxEDHx The very short answer to all of your questions is that I have essentially abandoned this list for the most part. I was really excited when Lazav first got spoiled, but I found out very quickly that he does not fit my preferred playstyle at all. My meta is also rampant with graveyard strategies, and with that comes graveyard hate to hose all of the graveyard-based decks. This list was a project to see how Lazav can be abused, and while I found him to have the potential to be blisteringly fast, I opted against building him for more preferable commanders based on what I personally like to do in a game and what the rest of the table likes to do in the game. He just didn't make the cut for me. No shade on him though, I think Lazav could work in some metas, just not mine I'm afraid. Gurmag Swiftwing is just bad. 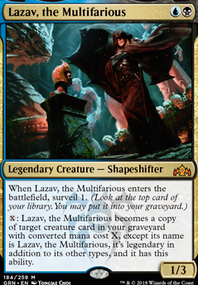 I guess you could declare Lazav as an attacker first as a copy of Swiftwing, but it feels a lot safer to just give him a static haste enabler for the turn with Blighted Bat and then turn him into Invisible Stalker before declaring attackers if you're going that route. Otherwise, you NEED Blighted Bat to pull off any hasty Necrotic Ooze combo. Swiftwing doesn't warrant a slot for that reason alone. It would just be fluff at that point. Careful Study is okay, but it's not actual card advantage. The transmute cards you listed are fine, but if I were to revise this list I don't think I would run any transmute cards because the obtainable targets are very conditional. The only reason why I have some in here is that they're also Nooze targets in the graveyard.